Dr. Kris Pelham Mayo is a veterinarian and classical homeschool tutor in the natural sciences. She received a BA in modern languages (German and French) from the College of William and Mary and a DVM (Doctor of Veterinary Medicine) from the Virginia-Maryland Regional College of Veterinary Medicine at Virginia Tech. After practicing clinical veterinary medicine and surgery for a number of years, Dr. Mayo joined the faculty at the Community College of Baltimore County as an adjunct professor, where she developed and taught online classes in veterinary technology. She has been homeschooling her 4 children (ranging from elementary school age through high school age) since they were born. Since 2011, she has also been tutoring high school laboratory science classes, including biology, chemistry, and physical science, for a local classical homeschool tutorial. Dr. Mayo is passionate about helping students learn more about their Creator by studying His creation! Students who enroll in her classes learn more than just science through a Christian worldview. They also learn how to learn. Many high school students can read a textbook, but they often do not really know how to study a textbook. Using classical, trivium-based techniques, her students learn for retention and develop practical study techniques, time management habits, and critical thinking and rhetorical skills that benefit them through high school and beyond. Dr. Mayo lives on a farm in Bowie, Maryland, with her husband, 4 children, horses, chickens, rabbits, and whatever other animals show up at the farm. 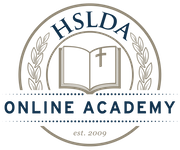 She is excited to be teaching knowledge, developing wisdom, and fostering understanding with a Christian worldview at HSLDA Online Academy. Dr. Mayo has been teaching with the Academy since 2017.